Draught Beer lines need to be periodically sanitized. This ensures that your beer tastes fresh and flavorful. creates unsightly flaking particles in your beer and will eventually destroy your dispensers components. your faucet and tap parts for cleaner and better performance and equipment longevity. We use a non-toxic cleaner that is Beer-Safe. We also adjust C02 psi for proper beer pour and will show you simple ways to pour a better beer! We also will check beer temperature to assure your beer stays fresh and pours to style requirements. The DRAFT DOCTOR will diagnose any needed *repairs or problems with your system. * (Additional labor and parts cost). every time you change the type of beer being served. We will leave you a contact service card with the dates of your last service as a convenience. BEER LINE SANITATION (BLS): PRICE; $95.00* (SINGLE LINE Local Service.) $125. two faucet systems. 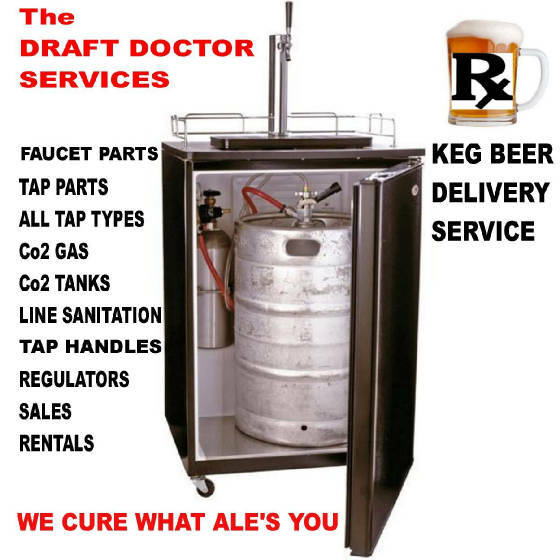 The DRAFT DOCTOR makes it simple for you! TERMS: MAKE PAYMENTS OUT TO, Case & Keg Beer World Inc. ll. We only accept C.O.D. CASH, MONEY ORDERS, and LOCAL CHECKS as payment.